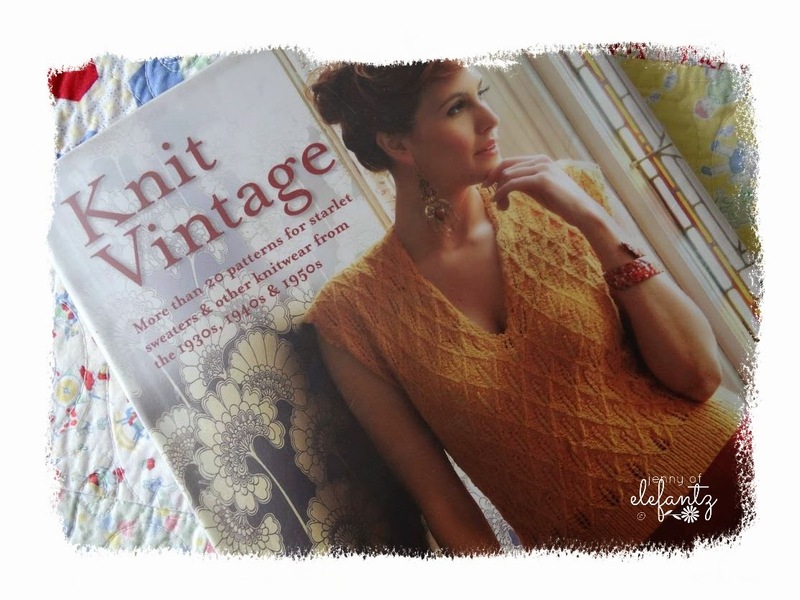 I fell in love with knitting when I was about 7 or 8 years old. A very patient aging aunt took it upon herself to teach me the basics of both knitting and crochet. The knitting I found to be delightful, the crochet a trial, so it was the click clack of tortoiseshell sticks that resounded through my Nana's little flat on many a cool evening when I was young. Having babies is a bonus for avid knitters, isn't it? All mine were decked out in pretty cardigans, mittens and hats straight from the hospital! I didn't stop knitting until the babies stopping coming, and that was simply because they didn't want to wear handmade anymore. So the needles were packed away, balls of wool donated to the op shop, and I dabbled in a bit of cross-stitch to while away the occasional rainy day until I discovered quilting and surface embroidery about 9 years ago. ...I knew there would have to be something inside to inspire me! She's naturally modeled her clothing style on Audrey Hepburn since she was about 10 years old, choosing pretty little sundresses for day to day wear even to this day(she is turning 21 this year). Isn't it the prettiest design?! When she saw the photos she immediately glowed with approval over my plan to knit it for her, so I'm going to. But I need some advice, as I have not knitted for years and 'back in the day' there wasn't as many yarns available and a 4ply was quite simply, just a 4ply. We live in the tropics, and quite frankly even in winter it's not cold, so I want to knit this in a cotton yarn. ...for a 4ply cotton yarn?? And would I need to change needle sizes from those used in the pattern? Any help from you lovely knitters would be so gratefully received. all those who contacted me with their desire to participate in the very first Stitchery Club Swap have been emailed their swap partner's information. If you haven't received your email would you please let me know and I'll resend to you. This is a secret swap so don't let on who your partner is, but feel free to share sneak peeks of your swap items on your blog or social media. 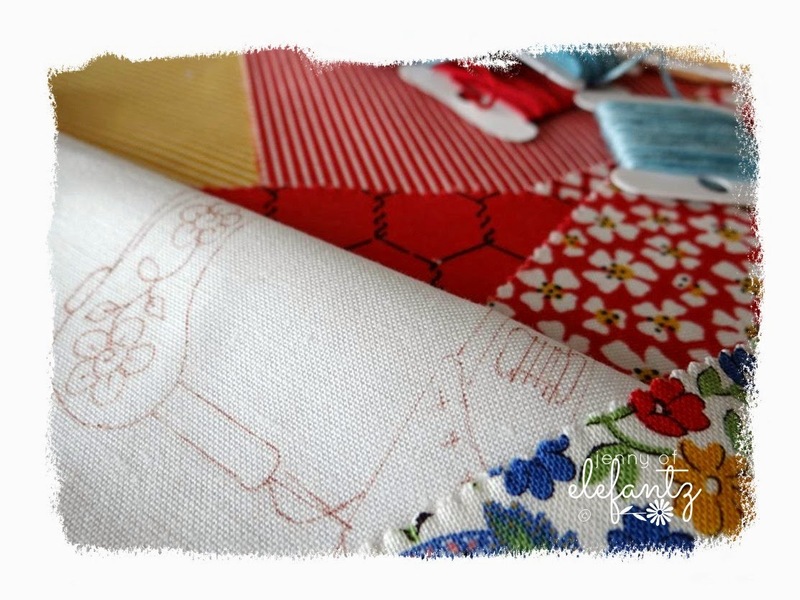 Today I am stitching away for my swap partner. I love the secrecy! I would be careful substituting cotton for wool. Cotton has a different weight and drape. I have used some lighter weight cottons successfully, but first do a gauge swatch. Then, wash the swatch to see how it drapes after washing. Most widely available cottons would be too heavy and distort easily. I can see why Blossom loved the cardigan. I love it too! Sorry I can't help you with your yarn question. I'm sure there will be someone out in blog land who can help. I'm quite excited about our swap. I've already made a great start on my project. I'm clueless about knitting, having had the opposite reaction to knitting and crochet. =) I love the sweater, though, and that little dress it's covering is adorable, too. I'm excited about the swap and will start planning this week! Do not swap wool for cotton. The design is balanced in weight, fibre, and size as it is. 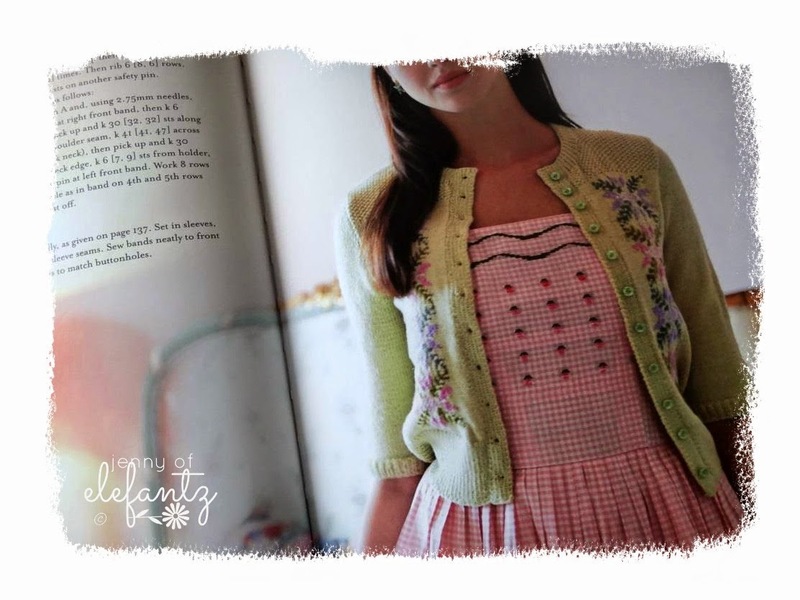 Cotton cardigans pull out of shape dreadfully when worn by children. 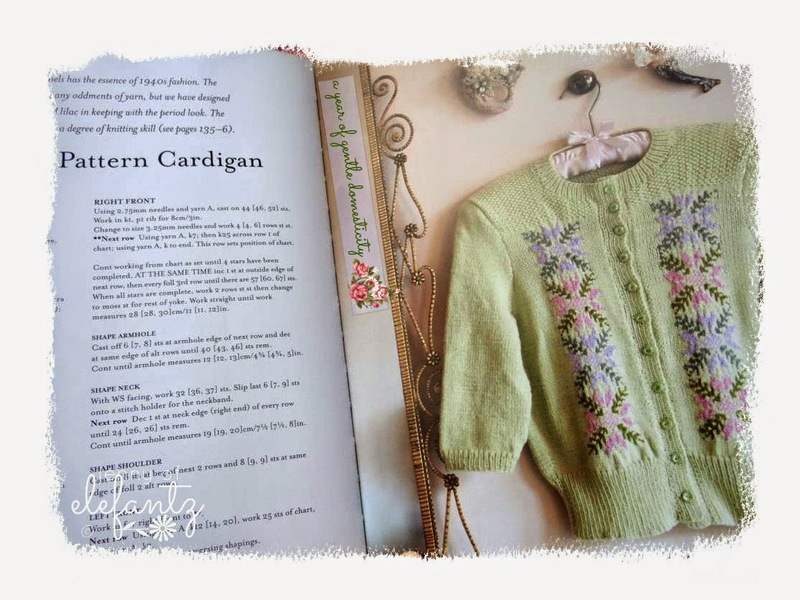 If you want to knit this cardigan but have a few simple doubts use acrylic instead of wool. This swap usually works well. This is a complicated project if you have not knitted for a while. It will also be expensive to make. Are these yarns actually available in Townsville or will you be ordering over the internet? If you doubt the usefulness of the garment then do not make it. Make something else. You could embroider a bought cardigan and get a similar effect. Make your sample squares before deciding to change needle size. For a project such as this I would also have a square where I attempt at least part of the pattern. Townsville gets cold in July so it is possible that your daughter will wear this cardigan a few times a year. Then it can become an heirloom and be stored for a cousin or grandchild. Thank you, Louise. Blossom is almost 21, and works in an air conditioned office, so if I use baby wool (or acrylic) it might actually be ok.
Will have a think about it - this would be something she'd wear a lot. Mm, I am agreeing with the no swap idea. 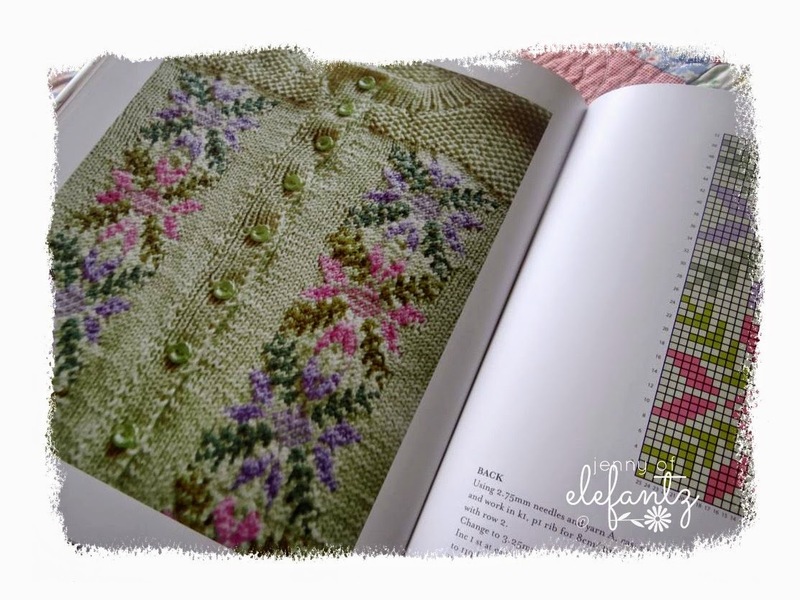 My very first thought was knit or buy a plain cardi and do some lovely Jenny Stitchery on it! I agree with a couple of the other comments. Don't use cotton..it won't have the same look and will have no give. You could try looking at Ravelry..see if anyone else has knitted the pattern ..there will be comments about the pattern and also what yarns people have used. I don't think the yarn suggested would be too bad in Townsville. The idea of contacting a yarn store is good too.. Try Yarn Glorious Yarn in Brisbane.. The lady who runs it will be helpful. Hi Jenny, cotton is definitely not a good swap. It doesn't give the same as wool so the stitches don't mesh together in the same way. I think the cashmere and silk sounds perfect. I suggest buying a few single balls and knitting up a square. If one is right then buy the rest. I did some recipe cooking for lunch and dessert today. Such fun. a little advice ... don't change yarn ... cotton is different from wool ... and the result will be different. I know nothing about knitting, but I love the sweater!! Lucky Blossom!! I am a knitter as well and have taught my granddaughters. My oldest Granddaughter, Abbey, is 10 now and makes things for her sisters. She loves to make up her own patterns. The sweater is adorable. Good luck with it! That sweater is beautiful! I knit a little, but not enough to advise you on the yarn switch. All the best to all of you, and especially to you Jenny. All your articles are welcome all over the day. I'm from France. Jerri is right - ANY Change in yarn means knitting a gauge/tension swatch first. And DO go to your local woolshop and ask for their advice - they should be helpful. I am knitting my husband a sweater at the moment- from a Phildar pattern I bought in 1979 [he is a truly patient man, waiting all this time!!] The suggested yarn is no longer made, but MY woolshop were incredibly helpful suggesting alternatives, and thus far it is knitting up beautifully. I'm sure you could knit this is a 4ply cotton I've knitted very similar Rowan yarn designs in it and Susan Crawford also does 4 ply cotton patterns. Both suppliers have good colour ranges. 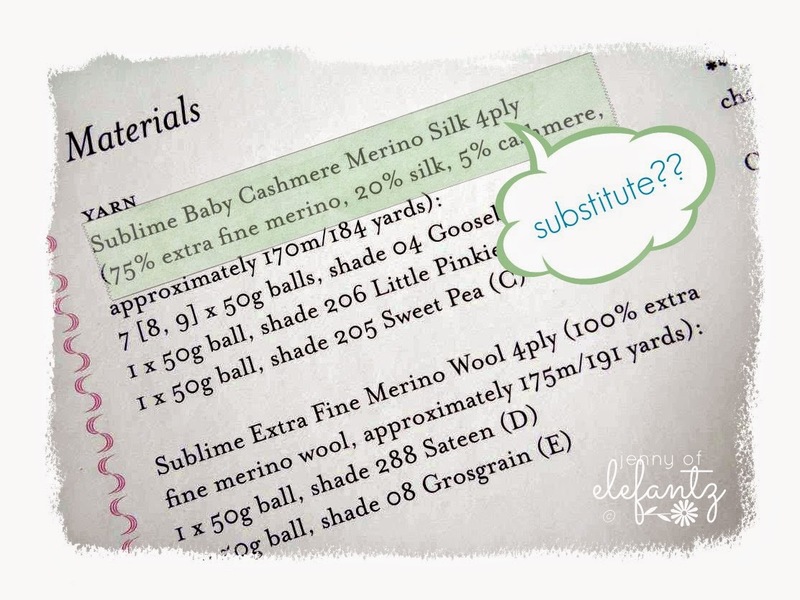 Just make sure that you check out the yardage so you have enough yarn as wool tends to go further! Gorgeous cardigan. Don't know about swapping fibres, however someone mentioned merino ... this is a fantastic fibre for both winter and summer wearing. 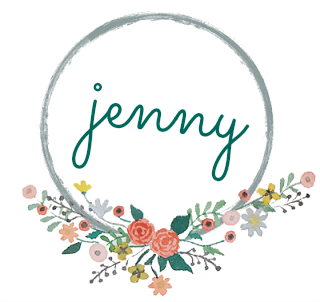 Would Bendigo Woollen Mills in Australia be any help to you, Jenny? Just a thought ... many travellers prefer to wear merino. What a lovely sweater. Sorry I don't knit. Looking forward to seeing your progress. I second everyone who said do a gauge swatch first. Also - you might look into a bamboo/cotton blend .. or something similar .. Cotton or bamboo does drape differently than wool, but if you like it, I'd go for it!